At a public meeting in 1980 it was agreed that both Geordie Hunter and Alex Morrison should be officially remembered for their contribution to the Shetland community and so the George L Hunter and Alexander Morrison Trust was established in 1981 with money donated by Shetland Islands Council. 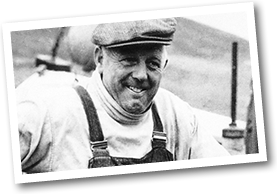 George Hunter, known as Geordie, started his working life at sea serving on a drift net fishing vessel as cook. At the age of 19 he left for the whaling in the summer months, returning to fishing during home leave. He later joined the Merchant Navy achieving the rank of second officer. In 1955 he decided to return to “the fishing” in Shetland and bought a boat called the Ocean Reaper (LK 64). He became involved in Shetland Fishermen’s Association, ultimately becoming a very popular Chairman. In 1975, he was elected as General Manager and Secretary to the Association by an outstanding 67 per cent of votes cast byShetland’s fishermen. During his five-year tenure the political importance of the Association grew rapidly, negotiating with the oil industry and attending to national and European issues became commonplace as Britain entered the EEC. Alex Morrison bought the shop in Brown’s Buildings, Lerwick in 1938 and a strong relationship developed with the people of the town, particularly fishermen and their families, with Alex providing unofficial credit during hard times. As well as giving numerous loans, he invested in fishing vessels which helped to ensure the future of the fleet. His shop became a central meeting place for those involved in the industry. 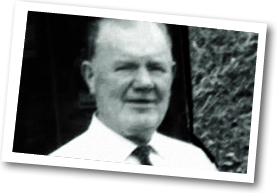 In 1944, he became a Shetland County Councillor and began a long and influential period in local politics. He became Chairman of the Fisheries Working Group and travelled as far as Luxembourg to fight for the rights of Shetland’s fishermen. Shortly before his death he was appointed Chairman of Lerwick Harbour Trust, now Lerwick Port Authority. The Morrison Dock, which was completed in 1981, is named in his honour.